Our annual Suzanne Aubert celebration day will this year be celebrated on October 7, the first Sunday in October. 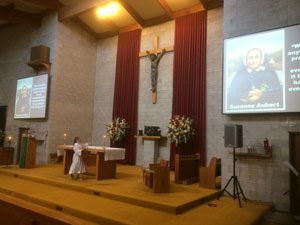 The purpose of this important national day of celebration is to have many more people learn of the spirituality and good works of Venerable Suzanne Aubert and to be inspired by what she did and what she achieved. It also provides all Catholics the opportunity to commit to praying that the church will soon recognise this remarkable woman of great faith, as a Saint. Realising that many new Catholics in New Zealand have probably never heard of Suzanne Aubert, we are very grateful that the Bishops and parish priests around the country allow us this opportunity once a year to better inform parishioners of who she was and what she did. Parishes will again be provided with a special Prayer of the Faithful, copies of the Intercessory prayer card in different languages, and an updated SA News to distribute in their parishes. This year we will be unveiling the Footsteps through Aotearoa campaign. More details will follow but please mark this very important date on your calendar, Sunday, October 7.